With America's workers already squeezed by forces ranging from international competition to offshoring to new information technologies, concern is growing about the impact of robots on jobs and wages. In Robots and Jobs: Evidence from U.S. Labor Markets (NBER Working Paper No. 23285 ), Daron Acemoglu and Pascual Restrepo find that deployment of robots reduces employment and wages, but they caution that it is difficult to measure net labor market effects. Since at least the start of the Industrial Revolution, economists and policy makers have pondered how relentless technological advances might impact labor markets. John Maynard Keynes warned in 1929 of coming "technological unemployment" and Wassily Leontief predicted several decades later that "labor will become less and less important." In recent years, a range of studies has estimated that nearly half of all U.S. workers' jobs will be at risk of being automated over the next two decades, and noted that this risk extends beyond laborers to include many white-collar occupations with substantial routine components. The researchers note that automation has several effects on the labor market. It may displace the workers performing a particular job in a particular industry, leading to reduced employment opportunities and wages for workers who historically held such positions. However, other sectors and occupations may expand to soak up labor freed from the tasks performed by machines, and it is even possible that productivity gains due to new automation technologies may expand employment possibilities in the industries in which they are deployed. The researchers focus on how the adoption of a specific type of automation technology — industrial robots — affects local labor markets. They use the International Federation of Robotics (IFR) definition of robots as autonomous, reprogrammable, multipurpose machines; this excludes single-purpose automated machinery and artificial intelligence technologies. By combining data from the IFR, the U.S. Bureau of the Census, and other sources, the researchers analyze the effect on labor markets of increases in industrial robot usage in 19 industries between 1990 and 2007. They measure the within-industry rate of robot adoption in countries other than the U.S., and pair that with information on the location of industrial employment across commuting zones to construct a measure of potential exposure to robots for each local labor market. 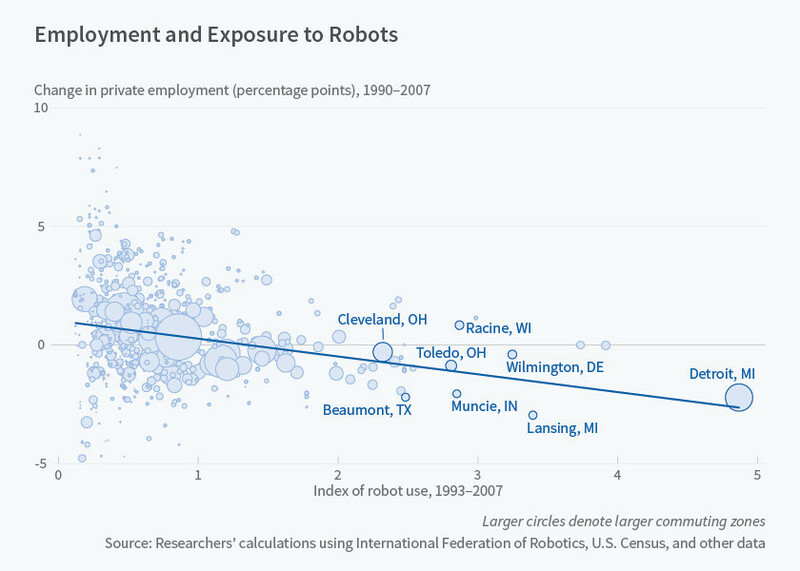 The researchers find large and robust negative effects of robots on employment and wages. They estimate that one more robot per thousand workers reduces the employment-to-population ratio by between 0.18 and 0.34 percentage points, and is associated with a wage decline of between 0.25 and 0.5 percent. The effects are most pronounced on industries most exposed to robots, on workers with less than a college degree, and on routine manual, blue-collar, assembly, and other related occupations. Robots appear to have a more negative impact on the employment of men than of women. Noting that there have been several other significant shocks to the U.S. labor market during their sample period, the researchers investigate whether growing imports from China and Mexico, offshoring, access to other computer technology, or changes in other components of the capital stock might confound their results. Their results are robust to all of these controls.